Dayal Padmanabhan's Aa Karaala Ratri, which has Anupama Gowda and Karthik Jayaram in the leads, has opened to positive reviews. 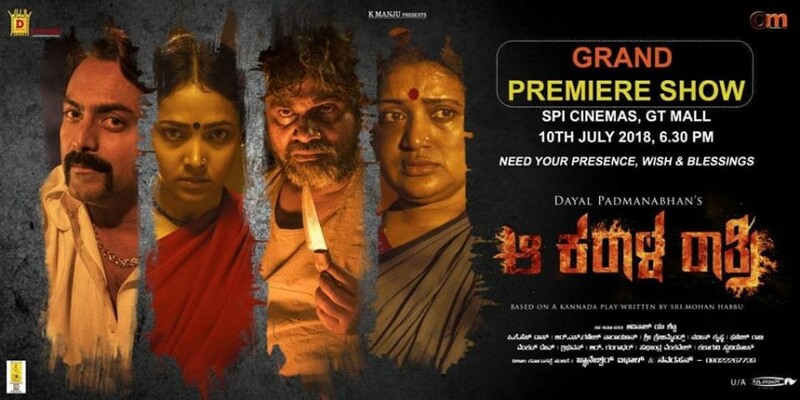 Dayal Padmanabhan's Aa Karaala Ratri, which had created a lot of buzz with its promos, has garnered positive reviews from the celebrities and critics. The Kannada film is the screen adaptation of a play written by Mohan Habbu. The original play was 20-minute long and Dayal has infused other elements to make it a full-fledged commercial entertainer without diluting the essence of Habbu's work. His screenplay has been given life by Anupama Gowda, Karthik Jayaram, Rangayana Raghu, Veena Sundar and others. A mysterious traveller Channakeshava (Jayaram Karthik) visits Malanna's (Rangayana Raghu) house after a fortune-teller (Naveen Krishna) predicts their lives will change overnight. He decides to stay in their house for a day and the drama that unfolds in the night is the crux of the story. The movie had its premiere on Tuesday evening, July 19 which was attended by celebrities and critics. Those who have already watched the movie, have heaped praised on Dayal's creation. "The best film of Dayal Padmanabhan #AaKaraalaRatri, [sic]" leading critic Shyam Prasad described the movie in one tweet. Noted filmmaker KM Chaitanya pointed out about the message part in the movie on his Facebook account, while highlighting about the performance and the technical contribution which have enhanced the overall quality of the film. "Good stories with good intentions, with good message to humanity is how Dayal Padmanabhan 's Aa Karaala Rathri unfolds on screen. Technically competent with great performances, the film tries to unravel the one quality that permeates society today - Greed. If you like good stories, heart fully rendered, go watch this at theaters near you! [sic]" he posted. Sihi Kahi Chandru, who has played a small role in Aa Karaala Ratri, wrote, "An absolutely brilliant adaptation of a kannada play. AA KARAALA RATHRI comes as a cool breeze in a hot summer. Brilliantly written by Naveen Naveena Krishna Brilliantly directed by Dayal Padmanabhan Brilliantly cinematographed by PHK Dass brilliantly enacted by Anupama JK Veena Sunder and Rangayana Raghu. Please do go to the theater and watch the movie. I bet you will recommend it to your loved ones. [sic]"
Also, RJ-turned-actor Sudesh Bhat, whose 6ne Maili was released recently, has shared good words about the movie. "Film Maker @dayalpadmanaban has created an AWESOME film titled ಆ ಕರಾಳ ರಾತ್ರಿ.... ಮುದ್ದೆ & ಕೋಳಿ ಸಾರು has played an IMPORTANT ROLE too. Best Wishes to team AKR :) :) [sic]" he tweeted. Dayal Padmanabhan's last two movies ( Toss and Sathya Harischandra) had failed to set the box office on fire. But the latest film is expected to become a hit.